Brooks resigned as the chief executive of News International on Friday. POLICE INVESTIGATING THE phone hacking scandal in the UK have arrested former News International chief executive Rebekah Brooks as part of their inquiries. Sky News cites sources as saying Brooks, the former editor of the now defunct News of the World, has been arrested. Multiple other news agencies are also confirming the arrest. Channel 4 News reports that the Metropolitan Police say the 43-year-old woman was arrested ‘by appointment’ in connection with phone hacking and corruption claims and that she is currently in custody. Brooks was arrested on arrested on suspicion of conspiring to intercept communications and section 1 of the Prevention of Corruption Act, according to the editor of the Guardian, Alan Rusbridger. Scotland Yard had at first issued a statement to say a 42-year-old woman had been arrested but then issued a correction saying the woman arrested is in fact 43, according to Keir Simmons from ITV. Brooks resigned as CEO of the Rupert Murdoch owned News International last week following the allegations that people working for the organisation engaged in the hacking of mobile phone voicemails including that of murdered school girl Milly Dowler. Since the scandal broke, numerous allegations have emerged including that the victims and families of those who died in the 7/7 and 9/11 terrorist atrocities had their phones hacked. The Metropolitan Police has been criticised for its perceived failure to properly probe the hacking scandal. The New York Times today reports on the relationship between former executives at News International and senior officers at the Met Police. UK prime minister David Cameron has been under scrutiny for his relationship with Brooks and former News of the World editor Andy Coulsen, his ex-communications chief, who was forced to resign in January because of the scandal. Coulsen himself was arrested recently and questioned over phone hacking allegations. There have been a number of resignations from News Corporation, of which News International is a subsidiary, most recently one of Murdoch’s most trusted lieutenants Les Hinton stepped down from his role as chief executive of the Dow Jones in the US on Friday. News Corp has been forced to shelve its proposed multi-billion pound bid for satellite broadcaster BSkyB under heavy political and public pressure in the UK. Rupert and James Murdoch are due to appear before the House of Commons select committee on media, culture and sport on Tuesday to answer MPs questions. Brooks will also face questioning separately from the Murdochs, committee chairman John Whittingdale told BBC this morning although her arrest could complicate that matter, Whittingdale telling Sky News this afternoon that he is unsure whether Brooks can still attend the hearing. Such is the depth of the story it is reported in today’s Independent on Sunday that Whittingdale is an old friend of Les Hinton and has been for dinner with him and Brooks. Whittingdale also appears as a friend of Rupert Murdoch’s daughter Murdoch and Hinton on Facebook. 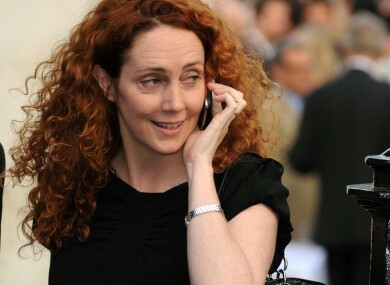 Email “Rebekah Brooks arrested in phone hacking probe”. Feedback on “Rebekah Brooks arrested in phone hacking probe”.